When installing twist on wire connectorss to electrical wires, please make sure you tighten the twist on wire connectors good and tight to the wires. If not you will have a headache of a circuit not working later and or a potential of fire in the electrical box. 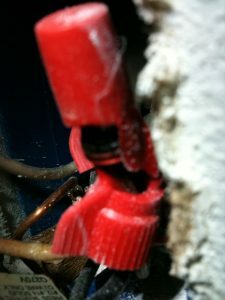 Here you can see a twist on wire connectors that the wires were not connected tightly and caused the twist on wire connectors to melt. Luckily the home owner smelled the burnt smell and turned off the breakers. We cleaned up the wires and installed a new twist on wire connectors.